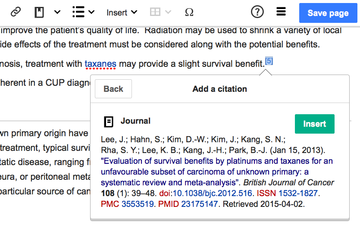 The citoid node.js service generates citation data given a URL, DOI, ISBN, PMID, PMCID or QID. It has a companion extension, Citoid, which aims to provide use of the citoid service to VisualEditor. It is currently deployed in all VisualEditor-enabled WMF-Wikis, though the extension is only configured on some of them. To request metadata about a URL, DOI, ISBN, PMCID, PMID or QID, you can use the English language API endpoint at https://en.wikipedia.org/api/rest_v1/#!/Citation/getCitation. Or for language localised request, use your preferred language Wikipedia. Bugs, issues, and suggestions for improvement can be added to the Citoid phabricator project. Best results are obtained if the URLs that are popular on your site are already available in Zotero. If they're not, performance will be better if you create Zotero translators for your popular sites first. WMF also has a fork of the Zotero translators which have slightly better coverage here. Citoid is a nodejs app that also requires a working installation of Zotero's translation server, which uses the Zotero translators library, and xulrunner. Install nodejs and npm. When you are using Ubuntu and depending on OS version you will not end up with the most recent version of nodejs. You are recommended to use nvm to manage nodejs installations. Warning: in order to run the current version of Citoid server, you should need the nodejs version 6, at least. Config.yaml contains the configuration for the citoid service. The defaults should work out of the box for development, however, they may need to be modified in a deployment set-up. This will start the citoid service on port 1970. To test it, navigate to http://localhost:1970 in your browser. You'll be able to test sample queries from this page. In order to have citoid functioning on your wiki in conjunction with VisualEditor, you'll need the following: VisualEditor and Parsoid, VisualEditor's Citation Tool, and the Citoid extension. It is recommended that you have the following extensions in your extension folder: Extension:VisualEditor, Extension:Scribunto, Extension:Cite, Extension:TemplateData, and Extension:ParserFunctions, and Extension:Citoid. Like VisualEditor, the master branch requires alpha builds of MediaWiki. If you're installing on another mediawiki version, use the right branch like git clone -b REL1_32 https://gerrit.wikimedia.org/r/mediawiki/extensions/Citoid. // browser will block the request. Sysadmins Full url to use the native citoid api, i.e. http://localhost:1970/api. Only used if VisualEditorFullRestbaseURL is null. Sysadmins Full url to use a citoid service running behind restbase, i.e. https://en.wikipedia.org/api/rest_. Overwrites default, which is to use VisualEditorFullRestbaseURL. Does not need to be set if you are running citoid behind the same restbase instance as parsoid/VisualEditor; mostly useful for point to a cross domain restbase citoid installation. The citoid extension must be configured using special TemplateData maps and a special citoid-specific message. It is currently deployed in all VisualEditor-enabled WMF-Wikis, but it must be configured before it can be used. Warning: Each template listed in Citoid-template-type-map.json MUST have a citoid maps value! Otherwise completely empty templates will be inserted. If there is no maps value for a given template, it is better to use a different template that does in the Mediawiki message, even if the types don't match well. Since Citoid has its own set of fields for each document type (for instance, the journal name is called 'publicationTitle' in citoid, but 'journal' in Template:Cite_journal), each Template must have TemplateData defined that creates a map between citoid's fields and the Template's field. Calling the map 'citoid' lets the citoid extension know which map to look for. If the map 'citoid' doesn't suit your purposes for use with say, a userscript, you may create a citoid service related map that is called something else; an unlimited number of maps with unique keys are allowed in the maps object. Note that you can only see TemplateData maps in edit mode; they are not visible in the TemplateData table. Fields issn and isbn can have Arrays  in the citoid map; using them ensures that only one ISBN is in the field. If you do not place the parameter inside an Array (i.e. isbn: "[ISBN]"), multiple ISBNs or ISSNS will be concatenated in the field (i.e. "issn: 1234-5678, 7777-7777'). All 'person' fields, e.g. author, editor, translator, contributor etc, require a 2D Arrays [] in the citoid map. See sample templateData below for examples. Warning: It is best if you add this message after each template has a template data map as specified in the above section. Otherwise, in the meantime empty templates will be inserted, because each template needs a template data map to be usable. You'll need to configure a special MediaWiki: namespace message. This message maps the native citoid types (website, book, journalArticle) to the appropriate template (Cite web, Cite book, Cite journal). You should match a template to every single citoid type; there is no default behaviour if no template is matched to a particular type. It's better to have a bad match (there may be some fields in common between video liner notes and a book, or video liner notes and a video, for example) than none at all. You may consider using en wiki's Template:Citation as a catch-all for types where there is no good type match as it is designed for this situation. Every available citoid type is listed as a key in the sample namespace message. is present and contains fields. Then verify that these data are making it to the MediaWiki API by visiting the API page, i.e. http://localhost/api.php?action=templatedata&titles=Template:Cite%20web/doc&format=jsonfm on your local installation, or https://en.wikipedia.org/w/api.php?action=templatedata&titles=Template:Cite%20web&format=jsonfm on en wiki. If the maps object is present in TemplateData, but not in the API response, try editing the template where the TemplateData is transcluded i.e. Template:Cite_web (but making no changes) and saving it, a.k.a. a "null edit". There is a known bug with transcluded TemplateData where it can take a long for the API to update (task T52372); null edits force the change. If the response from the API looks okay, there may be an issue with installation of the citoid service. Open up your browser's debugger to confirm that the responses from the citoid server are OK. The dates are in ISO format, which is an international standard. On the back-end, we're sticking to ISO and in the future all dates will all be in ISO, not just access date. This is because it is an unambiguous way to present the date in any language. If the community doesn't like the way this looks to the user, it is possible to edit the citation template to format the ISO dates to something that is standard in your language. For instance, you can add logic to the template such that if the date is detected to be in ISO yyyy/mm/dd format, the date is reformatted *to appear* to be dd/mm/yyyy on the page. However, if you do this, the underlying data (i.e. when you edit the wikitext, or the form in VisualEditor) will still remain the same. The Citoid service relies on the brilliant Zotero community for much of the "magic", as Zotero translators need to be written for each site. You can see a list of all Zotero translators at https://github.com/zotero/translators. Right now, Zotero best supports English-language sources. We need your help to improve coverage of other sites. You can write your own Zotero translator. Start by looking at Citoid/Creating Zotero translators. To test with translation-server, download and install https://github.com/zotero/translation-server-old Your translator will need to have the 'v' flag enabled for 'browserSupport'. More here on that: https://www.zotero.org/support/dev/translators As an example, see https://github.com/zotero/translators/blob/master/3news.co.nz.js ; you will see there are a bunch of letters, one of which is v, which corresponds to translation-server. If server support is not enabled by testing it/then adding the 'v' flag, we won't be able to use the translator. If you are using vagrant, you can enable the citoid role to hack on the citoid service. Please note, Zotero is only compatible with Ubuntu 14.04 and will not run on Debian's Jessie. And then import them: localhost:8080/wiki/Special:Import. After importing the Templates, you may need to navigate to the template, hit the edit button, and then hit save (a "null" edit), in order for the templatedata to propagate to the DB. npm test only runs jshint. npm run-script coverage runs the tests and reports code coverage. Citoid will also work with the official Zotero translators repo as well, but the output data will be different in some cases, and this will cause some tests to fail. Another reason why some tests may fail erroneously is if your DNS will redirect invalid domains to a valid IP (Such as BT Internet's DNS); in some cases, this causes a 520 response instead of a 400 response to be returned. This can be fixed by configuring your internet connection to use OpenDNS or another DNS that does not do this. Old Zotero translation server -- xpcshell-based Zotero translation server, and translation-server, a pre-alpha nodejs equivalent. This page was last edited on 21 March 2019, at 14:37.